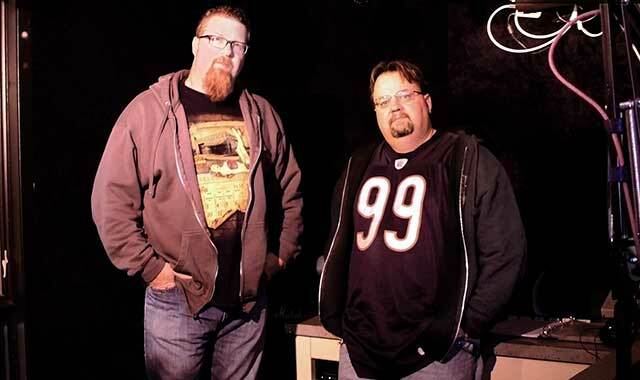 Rockford’s longest-tenured radio team has shared many memories with listeners, and through it all, they’ve remained a tight-knit duo, staying true to their work and to Rockford. Jim Stone and Terry Turen have been on the air together for nearly 14 years. Working as on-air partners in the radio business is a lot like being in a marriage. Just ask Jim Stone and Terry Turen, hosts of the Stone and Double T morning show, weekdays from 5 to 9 a.m. on 104.9 The X in Rockford. That pretty much sums up the relationship between Stone and Turen, better known by his moniker, “Double T.” For nearly 14 years, Stone and Turen, the longest-tenured local radio duo, have been wreaking havoc with their on-air antics, crude humor and unquenchable thirst for fun. As a student at Illinois State University, Turen pondered a career in television, as a camera operator or some other behind-the-scenes role. But after taking a broadcast journalism class, he decided television wasn’t in his future. Fortunately, a professor encouraged him to check out the college radio station, and the rest is history. After he flunked out of Illinois State, Stone took a job removing asbestos – work he didn’t particularly enjoy. He enrolled in a radio broadcasting school in St. Louis and took a part-time, weekend job at a local station broadcasting high school football games, reading obituaries and hosting a local swap shop. “It was Craigslist before Craigslist,” he says. In 2000, Stone left his job as general manager at a rock station in Terra Haute, Ind., to come work for the X.
Turen was working in production at the time, and Stone often asked him to appear on his show. The two immediately hit it off. “We started laughing and doing stupid stuff,” Stone says. It took another four years, however, before station management made the partnership official; thus, the Stone and Double T show was born. And, boy, have they had fun over the years. They’ve been to too many concerts to count; they’ve broadcast from Las Vegas, Los Angeles and, for each of the past six years, traveled by RV to Sturgis, S.D., for a week of broadcasting from the annual fabled motorcycle rally. They’ve interviewed famous rock stars, athletes and actors. They met Paul Mitchell and Peter Fonda at a concert in Milwaukee, and Stone bumped into Charlton Heston in the bathroom at the famous Spago restaurant. For four hours every morning, Stone and Double T not only play rock music, but talk about virtually everything. No topic is off limits. With a listening audience that caters to men ages 18 to 45, some of the banter can get a tad raunchy. “We’re like two guys talking in a locker room,” says Turen. They’ve also put their words to good use. They raised money to help Nashold Elementary School build a new playground. They slept in the back of a semi-truck for a week to raise funds for the hungry. And they’ve even been known to bring in mayoral candidates to discuss issues that impact the community. Still, there are certain temptations that come with the territory. Both Stone and Turen admit that they once got caught up in a lifestyle that surrounds the music scene – the non-stop partying that takes place at concerts and live remotes held in taverns. For Stone, the problems became too much to bear. His drinking was affecting his life at work and at home. Finally, he asked his boss for help, and he came clean to listeners as well. “It was serious, and it was real,” he says. As it turns out, Turen was coping with similar issues. A year after Stone sought treatment, Turen did the same. While they still do live remotes from bars, they no longer try to be “the life of the party.” And that suits them just fine. Stone’s personal growth continues. Two years ago, he found his birth mother after an extensive search. “It’s not changed my life, but it’s been a welcomed addition,” says Stone, who also met his brother in the process. These days, Stone finds contentment in spending time with his fiancée, Lindsey. His new addiction is riding his Harley motorcycle. Many days after work, he hops on and rides wherever his powerful bike takes him. Turen spends time with family. He and wife Amy have an 11-year-old daughter, Savannah. And when he’s not rocking out at concerts, he can be found rooting on his beloved Bears and Blackhawks. While these rough-edged veterans of the local radio scene appear to be a bit more mature and introspective than they once were, don’t get the wrong impression. Stone and Turen promise that their morning gabfest will remain edgy, entertaining and always on the brink of crossing the line. This entry was posted on Friday, December 6th, 2013 at 12:00 pm	and is filed under Northwest Business Magazine. You can follow any responses to this entry through the RSS 2.0 feed. Both comments and pings are currently closed.